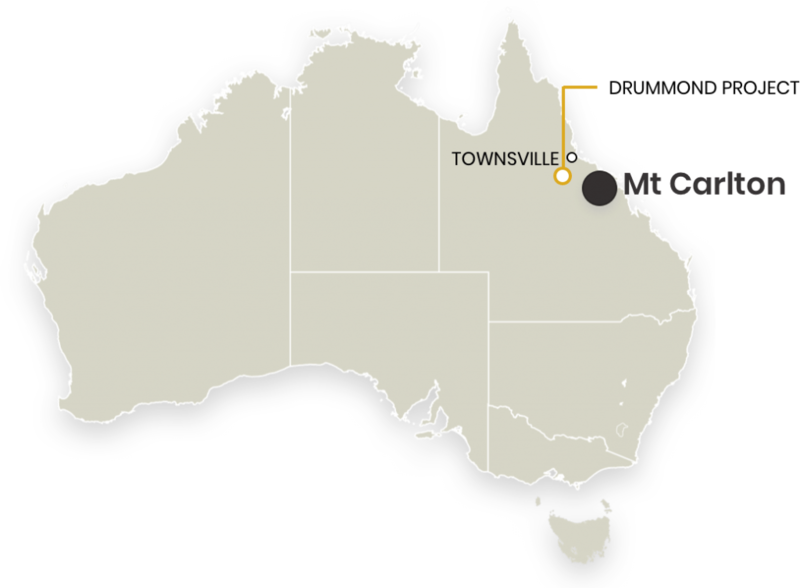 The Drummond Project is an early stage exploration project 140km south of Townsville and 50km west of Evolutions Mt Carlton Operation, in north Queensland. The Drummond Project is a joint venture between Evolution and Andromeda Metals Ltd. Evolution can earn a 51% interest in the Drummond Project by funding $2M of exploration over two years, and making a cash payment of $300,000 to Andromeda Metals Ltd. Evolution can then earn another 29% interest in the project by funding a further $4M of exploration over another 2 years, with another $200,000 payment to Andromeda Metals Ltd.
Joint venture with Andromeda Metals Ltd. Evolution can earn a 51% interest in the Drummond Project by funding A$2M over 2 year, and making a cash payment of A$300K. The Drummond Project is centered on the northern margin of the Drummond basin, an upper Devonian to lower carboniferous volcano-sedimentary basin. The Drummond basin hosts multiple Au deposits in North Queensland, including the Pajingo low-sulfidation Au-Ag deposits which are approximately 60km along strike to the west of the Drummond Project. The Drummond Project has outcropping epithermal vein fields that are high priority exploration targets. These vein fields show indications that the prospective crustal level for economic gold in epithermal environments remains preserved. To date target work has included geologic mapping and rock chip sampling, soil sampling, spectral analysis, airborne ‘drone’ magnetics and IP to generate drill targets for testing during FY19 . Target work to date also includes regional reconnaissance work to generate new targets for further testing. Accelerated key prospects towards deeper drill testing in the last quarter of FY19.